Fire is a really dangerous hazard, which can devastate homes and destroy many precious belongings. This is why it is important to take all necessary precautions to prevent it from ever happening and ruining your household. Unfortunately, sometimes it cannot be stopped on time, and some damage will occur. The sooner the process of remedying the outcome starts, the better. If you experienced fire damage in San Diego, it’s imperative to call the pros as quickly as possible for a detailed inspection and restoration of your home. Here’s what fire restoration includes. The first and foremost step of a fire damage inspection is determining whether there are any breaches in the structure left by the fire. A breach is any area which has been damaged in the fire, exposing the interior of the house to the outside. This usually includes checking roofs, windows and walls for such holes and sealing them with tarp in order to protect the interior elements. One of the crucial elements of post-fire damage is water damage. It occurs because the firefighters trying to tame the fire and put it out use highly-compressed amounts of this fluid to remedy the damage. When the fire is put out, their job is done, but not all water will evaporate. Some of it will be left behind in the form of puddles which can later on cause additional damage to the household if not removed. The areas of the house which have no leftover water will most definitely have soot covering the interior. Before making any categorization of the leftovers and assessing which of them are to be thrown out, the soot has to be removed from all surfaces. Soot is what’s left by the smoke after a fire, and a cleaning agent is necessary to remove it. Fire not only leaves soot but also the unpleasant smell of smoke. In order to continue restoration and make the air breathable again, the odor has to be removed. After water and soot have been cleaned, the ventilation ducts and HVAC systems should be filtered out in order not to spread any possible smoke leftovers. This should be carried out not only in the room affected by the fire, but all adjacent rooms as well. After all the necessary cleanup steps have been taken, you can start making an inventory of the items that are salvageable and unsalvageable. This will take some time, but after it’s done, the unsalvageable items can be cleaned out and the detailed list can be used for any possible insurance claims. The final, but also the longest part of the restoration process is reconstructing the home. Sometimes it is not possible to bring back the home to its former glory, but this is not necessarily a bad thing. Homeowners can find a positive outcome by remodeling into a new and perhaps more interesting household for them and their families. 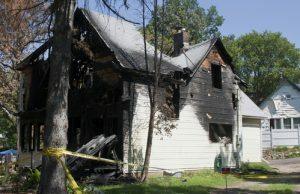 Fire damage can be very extensive and traumatizing. There is no need to make it even harder (or worse) by trying to remedy what is left all by yourself. Call the certified pros at KIC Restoration and look into a little brighter future.